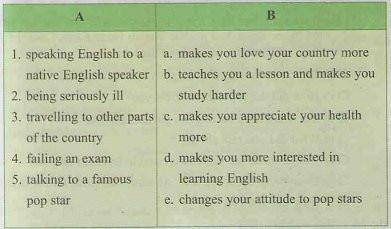 1. b: Have you ever spoken English to a native speaker? 2. d: Yes, I talked to an English girl last summer. 3. h: How did you meet her? 4. a: I was walking along Trang Tien Street when an English girl came up to meand asked me the way to Hoan Kiem Lake. I told her, then we started talking about the lake. 5. e: What did you talk about? 6. g: Even thing about the lake: its name, the great turtles in it, etc. 7. c: How did the experience affect you? 8. f: We'll, it made me more interested in learning English. A: So, how was your weekend? B: Oh, really good. I happened to see Cam Ly. B: That's rittht. Have you ever met her? A: Yes, I have. In one of her show in Ho Chi Minh City last years. She is very charming. B: Yes. She sings beautifully, too. A: Have you ever been to Ho Chi Minh City? B: No, I've never been there. A: You should go there sometime. It's an interesting city and the hotels are wonderful. A: Have vou ever been seriously ill? B: Yes. and I had to be away from home for nearly to weeks. A: How did you become so ill? B: I was in the rain in a winter afternoon for hours. B: Well. I went for a picnic and didn't bring my raincoat. A: How did the experience affect vou? B: It made me appreciate my health more.